I have a ton of fun in the first Maker Monday Live Stream. 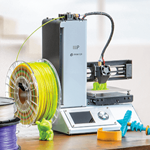 I review 3 of the best cheap 3D printers. I show how to set up the best for the best 3D print results. I then print some D&D terrain models and show how to paint them. Also because the video was live I answer a bunch of questions.